After requests by some top pros, we are now offering a 20mm offset for the KX450F. 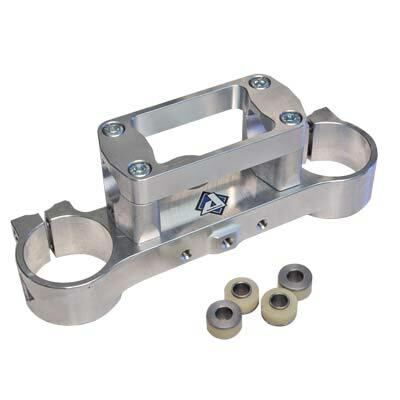 The clamps are completely CNC machined from 6061 and 7075 billet aircraft quality aluminum for superior strength and durability. Lighter than stock! Fork bores are precision machined for a perfect fit and greater clamping surface to reduce fork flex. Bar mounts are reversible to allow for a 3mm or 9mm forward, more aggressive bar position. Optional height bar mounts are available. 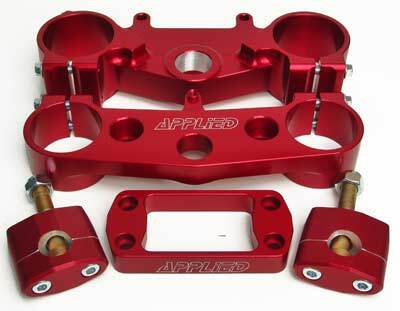 Includes upper and lower clamps, your choice of bar mounts, one piece bar mount cap, and all of the required hardware. Made in the USA with a lifetime warranty to the original purchaser! Rubber cones #3934 are a required additional purchase with this set.